"The Wild Lines of Jeremy Collins, 2019 Calendar" is a showcase of the artist's work. We talked to Jeremy to learn more about his personal philosophies as an artist. After the 2018 calendar by Jeremy Collins sold out in two months, the artist and Mountaineers Books decided to publish one for 2019 too (The Wild Lines of Jeremy Collins, 2019 Wall Calendar). Following are questions we asked Jeremy about how his climbing pursuits and his personal philosophy are reflected in his art. Your art often has a very specific point of view. Is there an overarching philosophy or message that you want to convey with your art? I suppose it’s embodied in the Edward Abbey quote where he encourages his readers to be like him: "...a part time crusader, a half-hearted fanatic. Save the other half of yourselves for pleasure and adventure". My work has a level of playfulness, but at times just a celebration of something powerful I find in nature. My philosophy is that to care for something you need to know it, and to know it you need to spend time with it. I spend a lot of time in the outdoors, and certainly with the drawings I create there; some more than others. I am tactically attached to the landscapes I create, often climbing or adventuring with in those same landscapes. How old were you when you realized that making art was your calling? I think it was likely in high school. My dad was a successful structural engineer, and we had explored the idea of Architecture as a path for me. Seeing as that I could barely succeed in Algebra, but was in the honors program for art and winning scholarships, I think the choice was easy. At the time, I was doing my first art related job—working at the local theme park, doing live portrait drawings. I didn't last long in college, enamored with a dirtbag lifestyle of climbing and having adventures primarily in the desert southwest. Somewhere in there I got my first job at Rock & Ice magazine illustrating articles and how-to’s. That was the door I needed. Has your art always focused on the outdoors and nature? My work is a result of what is on my mind, so it evolves daily from political to sociological to anthropological and, yes, my love of nature. 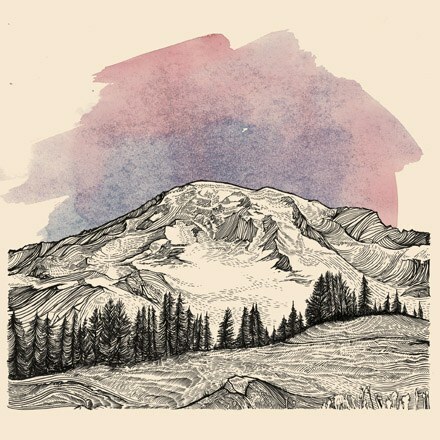 I think that underlying inspiration has always fed into my work from drawing horses nonstop as a young kid to now where I have a library of sketchbooks full of enough mountains and landscapes that I forget their names. The early part of my career in publications and product development was somewhat chaotic—always experimenting both with material and subject matter. It’s not that I don't experiment now, but for the last decade or so, my work has felt more consolidated in its vision. I am not afraid of a blank page. I feel comfortable there. Thanks for stopping by, Jeremy! 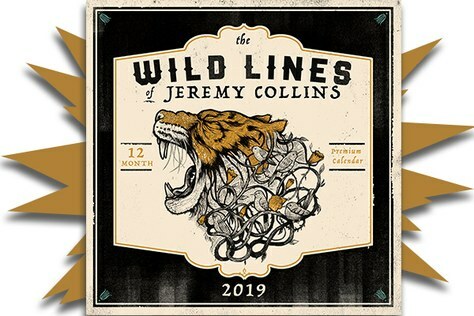 The Wild Lines of Jeremy Collins 2019 Calendar is now available for purchase, so be sure to pick up your copy. 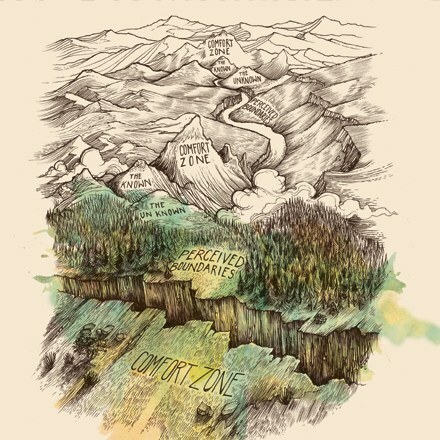 Jeremy Collins roams the earth with sketchbooks in hand, dumping his soul into their pages. It is in the folds of those pages that his particular worldview was born—from authentic travel and adventures as an exploratory rock climber to award-winning filmmaker and author. Follow his adventures on Instagram at @jer.collins and online at jercollins.com.